Billing itself as a family restaurant, immediately, one can ascertain that there will not be gourmet eats here. However, one look at the menu and there is a level of sticker shock. Other than the sandwiches and burgers, most entrees hover around the $15.00 mark or more. Again, we'll have to see how the food stacks up to the price. The adult meals may seem a bit pricey; yet the kids meals are quite affordable being roughly $5.00 to $8.00 (without beverage). 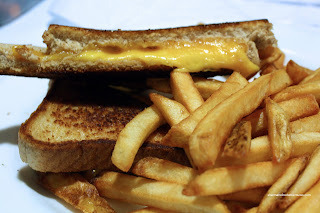 Of course my son chose his favourite - the Grilled Cheese with Fries. At $4.99, this was a pretty decent price especially since the sandwich was made with lots of real cheddar. For my meal, I went for the 10oz Baseball Sirloin served with mash potatoes and veggies. You know what? When it arrived, I was pleasantly surprised at how colourful and fresh looking the veggies appeared. This is complete night & day compared to Knight & Day (feeble attempt at humour there). In addition, the mash potatoes were made of real potatoes! 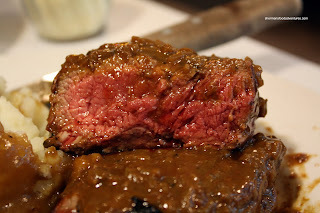 As for the steak, it was exactly how I like it, medium rare while closer to rare. It was moist, tender and juicy. 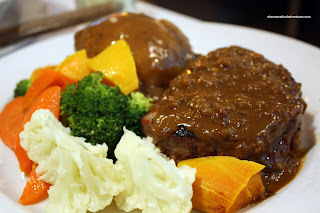 It's really too bad the onion gravy on top completely negated the natural meat flavour. With that being said, I did like the sauce, it was quite tasty while not being salty. Viv's dish was the baked Lasagna with a Caesar Salad to start. 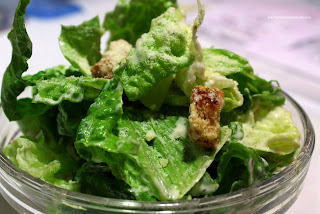 For what its worth, the romaine was fresh and crisp while there was just enough salad dressing. Nothing really special about the dressing mind you; but it did the job. The lasagna itself was massive. Initially, it didn't seem all that much; however, if you take into account the depth of the dish, it was quite substantial. Curiously, the sauce had bits of carrot and meat which made it resemble a Bolognese sauce except it was still very tomatoey. With that, it was tart and frankly quite one-dimensional. Again, it did the job. 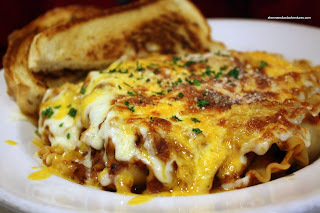 The lasagna noodles were surprisingly al dente. No small feat since it was sitting in sauce. This was all finished with a good amount of cheese on top. Funny I always remember seeing it all the time when going to Pne wayyyy back in the day. I have always been intrigued but not enough to actually step in the door haha. Seeing your post I might have to finally give it a try. Haha... I think I had the same fear you did, that's why it took me so long to return. The food ain't gonna set the world on fire, but it was decent. I normally give them the coupon before they total up the bill, saves them a step. American restaurant? I thought this restaurant was in Canada? 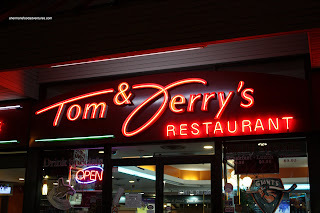 Yes, it's in Canada; but it serves American-type diner food. hey, i've wondered about this place. i drive by it a lot as well. i assumed it would kind of dirty and scary so i've never gone. maybe i will next time. i think i only go here because of a bakery... or one that used to be there. it's been a while. Thanks Trisha! Well, T&J's won't win any culinary awards, but with the coupon, it's alright. Not as bad as I thought it would be. Hey Sherman - how much (if you recall) was the steak you had ? LR, I think the steak was like $15? But everything is much cheaper now though at $9.95.